Beautiful Mosaic Solar Table Centerpiece creates a wonderful surface pattern. Fully weather resistant, improved solar panel and a brighter LED light make this 3rd generation version the most advanced product currently available! 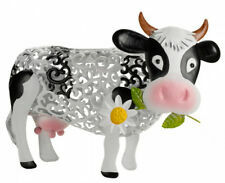 The Solar Silhouette Daisy Cow is lovely elegant addition to any outdoor space. Garden decor by day and silhouette light by night. Farmyard fun for your garden this comical cow has an intricate swirling meal body that casts a stunning silhouette onto surrounding surfaces when lit. 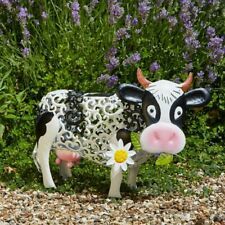 Daisy the cow is solar powered and so there's no wiring, simply choose from colour change or white light options and place her around your garden to illuminate at night. With her pretty scrolling body and characterful face on a spring, Daisy's head will wobble gently in the breeze adding instant fun and personality to your summer garden. This item has an integrated solar unit in its back and features 1 white and 1 colour-changing LED for red, blue and green light. At night the light from the LED displays a beautiful effect onto any surface. These solar-powered deck lights from Auraglow can be installed anywhere outside where there is direct sunlight. Contains 4 x Cool White (6500k) LEDs. Can be installed using the included ground spikes or scattered freely in your garden. This incredibly decorative solar lamp adorns and gently illuminates your garden, terrace or balcony. The lamp is powered by solar energy, which means there is no need for cables wandering between the trees and of course the total cost of electricity! The additional advantage of this lamp is that it automatically turns on after dark, so you do not have to worry about whether your garden is beautifully lit in the evening - with our solar lights will always be! Solar lamp designed to illuminate stairs, railings, sidewalks and other sloping architectural elements.. 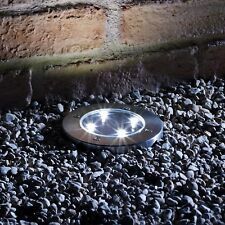 LED Aluminium Solar Spot Light. Angle of the spotlight can be adjusted freely. Material: Aluminium. 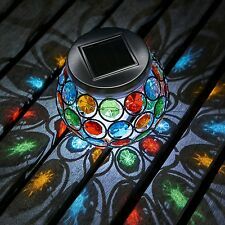 This incredibly decorative solar lamp adorns and gently illuminates your garden, terrace or balcony. SOLAR POWERED. Solar powered with adjustable height. Efficient, Eco Friendly. Eco friendly as no wires required. Power source type solar. PAIR of BLACK OUTDOOR. Easy to install for instant garden style! Garden Solar Light. Solar powered. We check these regularly for cancellations. We promise that by choosing us, not only you grab a bargain, but also get fantastic service. Each requires 1 x HL40H battery (included). Features:Brand New & High QualitySolar powered, easy to install.Light control, the wall light is not bright in daytime, while it is dim-bright at night.It can be widely used for lighting and decoration of fence, gutter, outdoor, garden, yard, roof, stairs, etc.Specifications:Item Type: Motion Sensor Wall LightLED Source: 49 LED 2835 SMDLumen: 8-10ＬＭ per LEDIngress Protection: IP65Voltage: 5.5VPower: 2WMaterial: ABS PC AluminumBattery (built-in): 3.7V 2200mah 18650 Charge Time: 8hWorking Duration: Over 12h1 pieces Packed Type: Net weight:265g &nb. Set of 2 stainless steel solar lights Dacio from Globo. Condition is New. t orch pole powder coated for duribility. l ong lasting fiberglass wick. They fit perfectly on any table individually, or group more than 1-together to make a centerpiece. The convenient size makes them perfect for illuminating buffets and drink stations. Easy fill canister. Uses Traditional Torch Fuel. Reusable Roundwick Burner System Will Last A Full Season. Ground spike solar light Tycho, stainless steel from Globo. LED outdoor wall light, solar-powered from Duracell. Luxform Ref: 39187. This solar wall light is suitable for mounting next to front or back doors and near to sheds, garages and carports etc. as a functional light. This high quality solar light is aluminium and powder coated to ensure many years of use. – TWILIGHT SENSOR: The twilight sensor located inside the solar panel, has the function to automatically turn on the garden lamp when the sun goes down and causing it to shut down automatically when the sun rises. This is brand new and never used. Features: Fine workmanship, delicate appearance, long lasting. Fashion design, convenient to use. Energy-saving, green and environmentally friendly, is conducive to recycling. Specifications: Size:15*22.5*20cm Product Name: 60LED Solar Induction Lamp Optional color: white light (high brightness) Solar panels: amorphous silicon 5.5V/200ma solar panels Light source type: 60LED patch bead 2835. Designed with detachable / separable solar panel. Solar Panel: 1W 6V Polycrystalline. 1x LED solar light. Solar cable: 2.8m. 1x Solar panel and Cable. Waterproof: IP65. LED: 20x SMD2835 LED. 1 wine bottle wick holder, great for wine bottles, to create your tiki torch candles. This aluminum wick holder includes 10" round 1/4" fiberglass wick for each wick holder. No need for longer wicks, fiberglass wick does not burn away like cotton wick. A ground spike is provided so that the light can be placed into the soil. This high quality solar light is aluminium and powder coated to ensure many years of use. With PIR Sensor. Colour rendering index: Warm White. In the picture you can see the result of two solar power installed in a building. – NO CABLE: By working through solar energy, the solar powered lamp does not need. The led solar powered lamp for outdoor use is made of aluminum and ABS and is ideal for illuminating driveways and public gardens, squares, parkings, dark regions etc. Features: Controlled solar courtyard light. Lightweight and fashion design, convenient to use. Eco-friendly and harmless to human. Specifications: Size:22*18*22CM Color: white Solar panels: 6V/3W Battery: 2* lithium battery 4000mAh (battery is not included) Material: cast aluminum Light Source: Single bulb, 240LM Mode: switch is always bright..
TIKI TABLE TOP TORCH SILVER GENUINE ALUMINUM VERY NICE! (SEALED SET OF 4). Condition is New. The Flower Torch Head. They provide a distinctive lighting effect for evening outdoor entertaining. And they discourage the intrusion of insects and other pests that every outdoor entertaining area can do without. Solar powered garden light on stainless steel spike ONE SUPPLIED Battery Requirements: 1 x 1.2V included 55cm tall Super-bright LED Ideal for decoration or security No cost to operate No wiring - just push into the soil Photo-cell sensor Turns light on/off at dusk/dawn automatically . Solar LED wall lamp Joelina from Lampenwelt . The product's energy efficiency class is: A . LED headlight V-Tac VT-100W with power of 100W and black aluminum body. Composed of 2 separate units: polycrystalline solar panel with fixing bracket and light with integrated battery. SMD LED with 120 ° light beam and 2450 luminous flux lm. Mahra is powered solely by the sun. It features a motion detector to ensure that the solar-powered outdoor wall light switches on and off in an intelligent manner. Besides the variant in which the lamp only lights up when it detects movement, there is another settable mode: If a movement is registered, Mahra switches on at full brightness; otherwise it illuminates at 15% brightness after dark. The motion sensor can be adjusted: the lighting duration can be set from 8 secs to 8 mins and the range from 6 to 10 m. The detection angle is 120°. 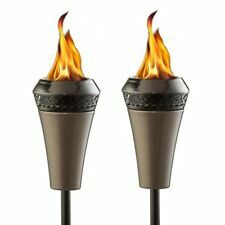 2 Tabletop Tiki Torches. Wick included. set of 2 for this price. Aluminum Wine Bottle / Oil Lamp Jar Wick Holders DIY Tiki Torch Oil Candle Wick Holders. There are many wine bottles that have different size openings! This is not a cork or a stopper, it is designed to hold the wick in place and sit on top of your bottle with the neck of the wick holder extending down inside of the wine bottle. Premium LED solar skewer from genuine Crystal 45 cm LED solar lamp LED solar lamp. Solar lights. The solar globe suited to the garden or the terrace to decorate. Plug you just in a flower pot the table or the windowsill. The motion detection (the action area of the sensor) the armature passes to the condition "high brightness". Illumination angle 120°. Note: all modes (mode 1, mode 2, modo3) will take effect only at dusk. LED lamp V-Tac VT-787-10 with power of 10W, security sensors and dual motion detector. < span class = "notranslate" > beam of 180° and luminous flux of 1100 lm. 135° tilt Panel, you can direct the light beam where best serves. LED solar wall light Henk with sensor from Lampenwelt . The product's energy efficiency class is: A . WHERE TO INSTALL THE GARDEN LAMP WITH PHOTOVOLTAIC PANEL – NO INCREASE IN THE BILL: Just for not being connected to the electricity grid, the solar powered lamp will provide illumination all night long without increases in energy bills. Valerian is powered solely by the sun. It features a motion detector to ensure that the solar-powered outdoor wall light switches on and off in an intelligent manner. Besides the variant in which the lamp only lights up when it detects movement, there is another settable mode: If a movement is registered, Valerian switches on at full brightness; otherwise it illuminates at 15% brightness after dark. The motion sensor can be adjusted: the lighting duration can be set from 8 secs to 8 mins and the range from 6 to 10 m. The detection angle is 120°. Jersy is powered solely by the sun. It features a motion detector to ensure that the solar-powered path light switches on and off in an intelligent manner. Besides the variant in which the lamp only lights up when it detects movement, there is another settable mode: If a movement is registered, Jersy switches on at full brightness; otherwise it illuminates at 15% brightness after dark. The detection angle is 120°. Range 6-10 m.
Screw type clamp - Fits up to 3-3/8 in. thick wood or vinyl deck railing - Burns up to 6 hours. Mariana angular LED outdoor spotlight, graphite from Lampenwelt . The product's energy efficiency class is: A . Solar path light Henk with motion detector from Lampenwelt . The product's energy efficiency class is: A .
Tipo lampione a energia solare. Solar powered Led lamp: led garden lighting, driveway and outdoor space in General. Solar powered led lamp with photovoltaic solar garden lamp. -SOLAR PANEL: 7 watt solar panel located at the top of the outdoor lamp, has the function to load the inserted batteries. For sale is a vintage tropic torches set new and still in original packaging. The box measures approximately 18"×7"×7". For the best description please refer to my pictures. If anyone has any questions please feel free to ask. Thank you.